Chai is the official tea of India and it is not like the tea we are accustomed to in the United States or United Kingdom. Real Indian tea is often replicated, but never duplicated! It's delicious and requires particular ingredients that must be prepared in a particular way to obtain the desired end result, which is delicious, hot and somewhat spicy tea! That's right, this tea is prepared using the famous Indian ingredient of masala. It's very different from that stuff sold at your local coffee shop, but it certainly has the ability to wake you quickly! This tea must be prepared properly, and when it is, it is quite delicious. In fact, one cup per sitting probably won't be enough for you to satisfy, so be sure to make enough to drink two per person! Some of the ingredients may be unfamiliar to you; that's okay. Simply look for your local Indian Grocery store to find any ingredients that you can't find at your regular supermarkets. Stores are always small businesses who are happy to help you find the ingredients that you need. This recipe makes two glasses. Now, let's do it! 6. Strain, serve and enjoy! If masala is not desired, you can make it without. You can also add in lots of fresh mint leaves for extra deliciousness! When you begin making it, you will determine how you like it best and prepare it accordingly. 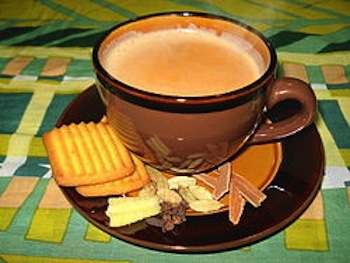 A lot of people enjoy drinking their Indian tea with crispy and flaky pastries or biscuits. It replaces coffee in India as the most popular breakfast and afternoon beverage. When shopping in India, it customary to be served this tasty beverage, and it is tough to turn down. The interesting thing is that it is normally drunk out of a bowl. If you want the Indian dining experience, you must include real India chai. Discover what its like in India today!